SONIQ U-Series 58" 4K Ultra HD LED LCD Smart TV U58V14A. The U-Series 58" boasts everything you would want from your standard Ultra HD TV. 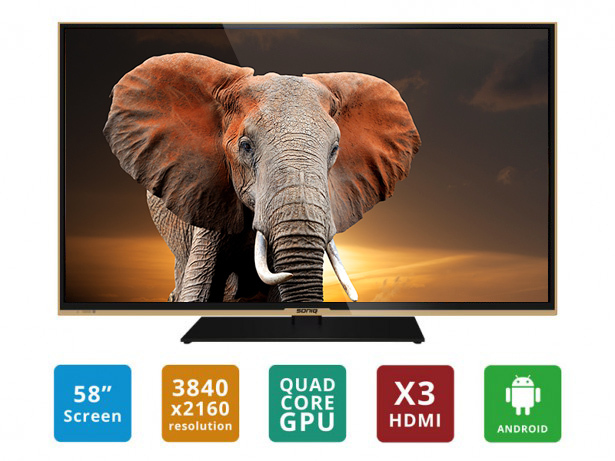 With a QuickMotion 60Hz Refresh Rate and 3840 x 2160p LED Backlight Panel the U-Series 58" is perfect as a main or supplementary TV for your Lounge, Bedroom or Mancave. Enjoy a truly cinematic experience with Super MVA Technology and an Ultra Wide Viewing Angle able to provide 4K @ 50/60Hz.